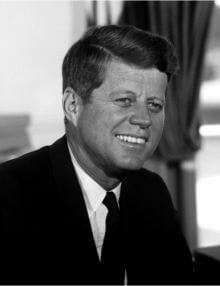 Born: 29th May 1917, Brookline, Massachusetts, U.S.
Died: 22nd November 1963, Dallas, Texas, U.S. Occupation: Journalist, U.S. Navy Lieutenant and 35th President of the U.S. Literary awards: He was awarded the Pulitzer Prize for Biography in 1957 for his book "Profiles in Courage"
Quotes about John F. Kennedy: Eminent historian, Samuel Eliot Morison recognised his greatness when he said: "With his death something died in each one of us; yet something of him will live in us forever"
One of the most poignant reactions to the death of JFK was from Leonard Bernstein when he said: "We must go on. Life goes on ..... we can’t go on" Bernstein then composed himself and said: "Of all the political men that I have ever met, Kennedy was certainly the most moving and compassionate and lovable"
Nikita Khrushchev said of their meeting: "I was generally pleased with our meeting in Vienna. Even though we came to no concrete agreement, I could tell that Kennedy was interested in finding a peaceful solution to world problems and avoiding conflict with the Soviet Union"
Despite the Cuban missile crisis Fidel Castro still said this of him: "He has the possibility of becoming, in the eyes of history, the greatest President of the United States, the leader who may at last understand that there can be coexistence between capitalists and socialists, even in the Americas. 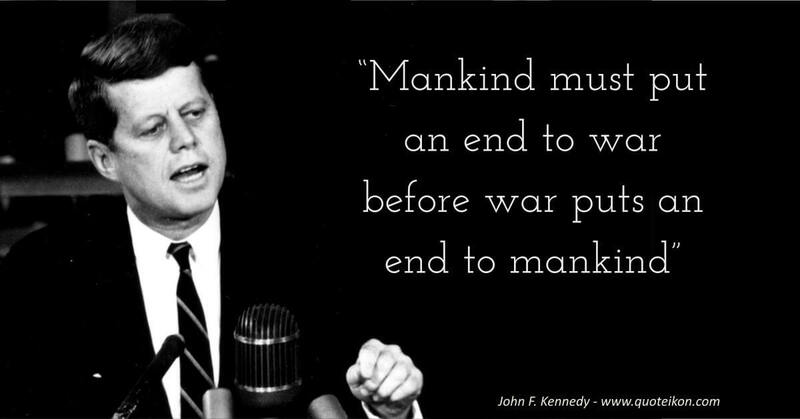 He would then be an even greater President than Lincoln"
His wife Jacqueline Kennedy knew she was right when she was quoted as saying: "Don't let it be forgot, that once there was a spot, for one brief, shining moment that was known as Camelot. There'll be great presidents again ... but there will never be another Camelot"
"We celebrate the past to awaken the future"
"There can be no progress if people have no faith in tomorrow"
"I believe that this nation should commit itself to achieving the goal, before this decade is out, of landing a man on the Moon and returning him safely to the Earth"
"While we shall negotiate freely, we shall not negotiate freedom"
"I believe in an America where religious intolerance will someday end — where all men and all churches are treated as equal"
"War will exist until that distant day when the conscientious objector enjoys the same reputation and prestige that the warrior does today"
"If more politicians knew poetry, and more poets knew politics, I am convinced the world would be a little better place in which to live"
"Let us not seek to fix the blame for the past - let us accept our own responsibility for the future"
"In a world of danger and trial, peace is our deepest aspiration"
"In the long history of the world, only a few generations have been granted the role of defending freedom in its hour of maximum danger. I do not shrink from this responsibility - I welcome it"
"If you are awaiting a finding of "clear and present danger," then I can only say that the danger has never been more clear and its presence has never been more imminent"
"The great enemy of the truth is very often not the lie - deliberate, contrived and dishonest - but the myth - persistent, persuasive, and unrealistic"
"Without debate, without criticism, no Administration and no country can succeed"
"Together we shall save our planet, or together we shall perish in its flames"
"Our progress as a nation can be no swifter than our progress in education"
"An error does not become a mistake until you refuse to correct it"
"We can have faith in the future only if we have faith in ourselves"
"Self-determination is but a slogan if the future holds no hope"
"Things don't just happen, they are made to happen"